This portion of OBXAirWaves.com will be to inform and provide some information about Amateur Radio and the local Ham operations. Amateur radio, often called ham radio, is a hobby enjoyed by about six million people throughout the world. An amateur radio operator, also known as a ham or radio amateur, uses various types of radio equipment to communicate with other radio amateurs for public service, recreation and self-training. 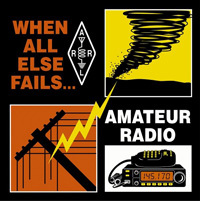 Amateur radio operators have personal wireless communications with friends, family members, and even complete strangers, and often support their communities with emergency and disaster communications while increasing their personal knowledge of electronics and radio theory. The legal term "amateur" in this sense is not a reflection on the skills of the participants, which are often quite advanced; it just indicates that the associated frequency spectrum cannot be used for commercial or money-making purposes. In all countries, amateur radio operators are required to pass a licensing exam displaying knowledge and understanding of key concepts. In return, hams are granted operating privileges in larger segments of the radio frequency spectrum using a wide variety of communication techniques with higher power levels permitted. This practice is in contrast to other unlicensed personal radio services such as CB radio, Multi-Use Radio Service, or Family Radio Service / PMR446 that require type-approved equipment restricted in frequency range and power. The birth of amateur radio, and radio in general, was associated with various amateur experimenters. Throughout its history, amateur radio enthusiasts have made significant contributions to science, engineering, industry, and social services. Research by amateur radio operators has founded new industries, built economies, empowered nations, and saved lives in times of emergency. Below is a Video I ran across on Youtube that explains HAM and getting into HAM radio very simply. Thank you for putting this together KC9TJV.